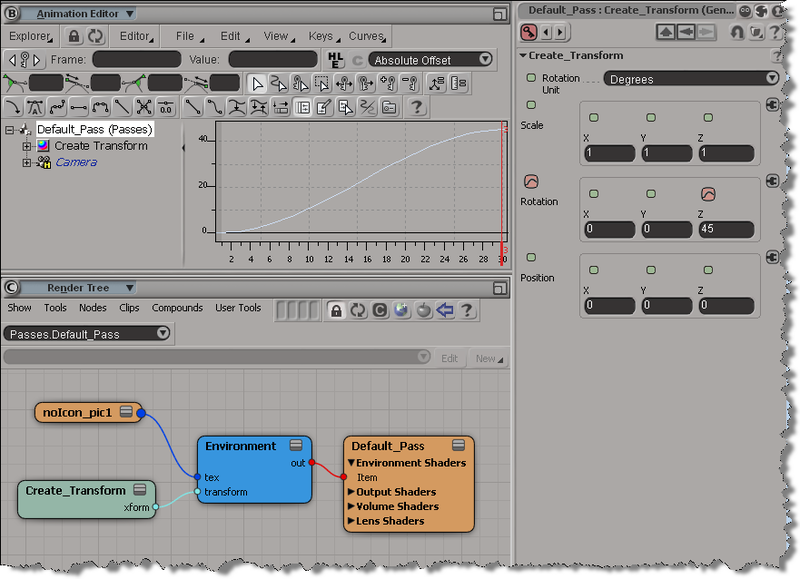 In the 2011 release, parameters like the Environment shader’s Transformation parameter were changed to expose the raw transformation matrix instead of StaticKineState. This allows ICE attributes to plug directly in the shader input matrix ports and have texturable matrix ports. A transformation matrix is a combination of the scaling, rotation, and translation, and when you start animating those values, you’re going to see some “weird” numbers 😉 For example, if I animate the Z rotation from 0 to 45 degrees, I’ll see this in the Animation Editor. Note that in the viewport I’m using ICE to show the transformation matrix for a cone that has the same Z rotation from 0 to 45 degrees: see how it matches up with the fcurves for the Environment transformation. To make things more artist-friendly, you have to make the Transformation parameter texturable so you can plug in a Create_Transform node in the render tree. To make the Transformation parameter texturable, install this addon. This entry was posted in Addons, Shaders and tagged Create_Transform, Environment shader, Softimage, transformation matrix by xsisupport. Bookmark the permalink. You need a forum Blair, seriously. there doesn’t seem to be a transform port in my environment node, is there a way to add or reveal one? The Transformation parameter should be in the Environment PPG; you shouldn’t have to do anything. 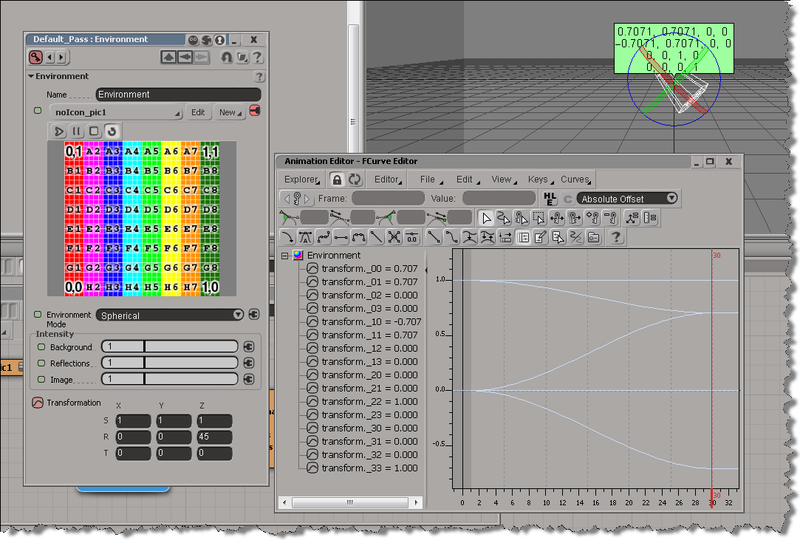 I just checked in Softimage 2015, and it was there.